Musical highlights include Tournemire’s office from L’Orgue Mystique for the day (Purificatio B. Mariæ Virginis), played by Mr. Thomas Schuster, Organist and Director of Music at Church of the Epiphany, as well as a Missa Brevis by Zachary Wadsworth, and a commissioned motet by Dr. Paul Weber (Franciscan University of Steubenville.) Choral works will be sung by the Schola Cantorum of the University of Florida under the direction of Dr. Edward Schaefer. The Gregorian propers of the day will be sung by a Women’s Schola Cantorum under the direction of Dr. Jennifer Donelson of NOVA Southeastern University. The celebration is part of a Tournemire Symposium organized by the Church Music Association of America (CMAA), and will be live-streamed at www.livemass.net. 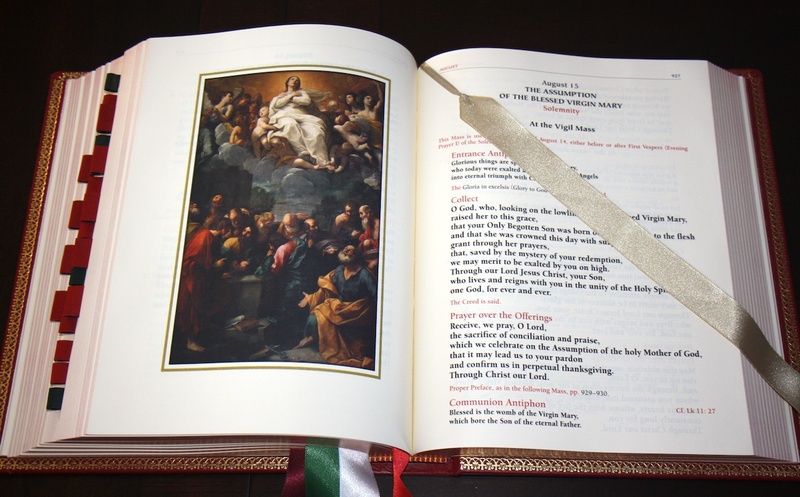 For more information on the live-streaming, as well as catechetical events associated with the mass, go to the Musica Sacra Florida website. CORRECTION: [01/02/12, 11:31 PM] An alert reader informs me that the address for the church (as opposed to the rectory) is actually 8235 S.W. 57 Avenue, Miami, FL 33143, Miami, Florida. As Thursday is Candlemas, called in the traditional Dominican Rite the Feast of the Purification of the Blessed Virgin Mary, I though that it might be a suitable time to post something about the rituals attached to this feast in the Dominican Rite. These rites are the same in both the 1933 and 1965 Dominican Rite Missals and seem to go back virtually unchanged to the thirteenth century. Let us pray. Almighty and everlasting God, who on this day presented your Only-Begotten Son to be received into the arms of the Blessed Simeon in your holy Temple; we humbly entreat your clemency that you would be pleased to + bless, to + sanctify and enkindle with the light of your heavenly blessing these candles, which your servants wish to receive and carry lighted to the honor of your name; that by offering them to you, our Lord and God, we being worthy and inflamed with the holy fire of your sweet charity, might deserve to be presented ourselves in the holy temple of your Glory. Through the same Christ Our Lord. R/. Amen. The prior then sprinkles the candles with holy water from the stoop held by the acolyte. The cantor then comes forward and offers a lighted candle to the prior and intones the Antiphon Lumen ad Revelation Gentium. 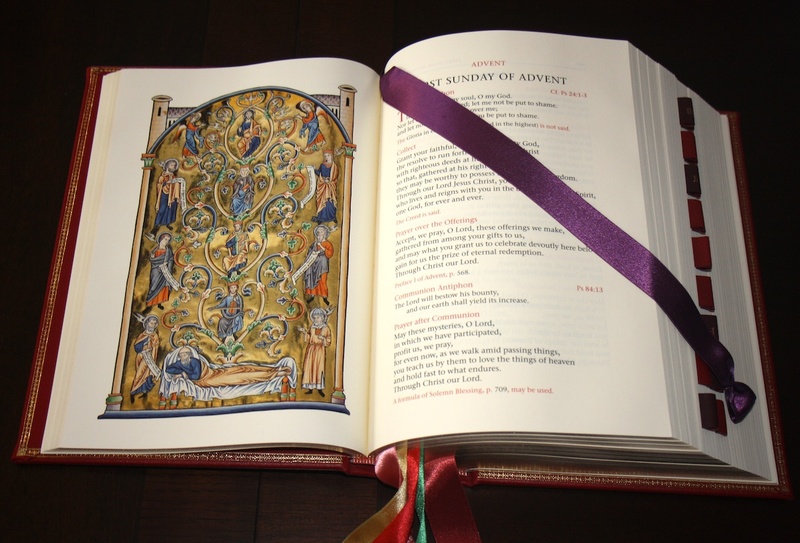 It is sung by the community and followed by the chanting of the Nunc Dimittis, during which the antiphon is sung again after each verse of the canticle. This chant is repeated as many times as necessary for lighted candles to be distributed to the whole community. 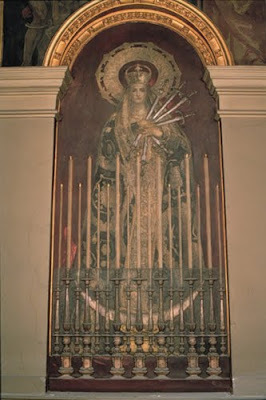 At Station 1: Ave Gratia, which celebrates Mary's role the birth of Christ who is light of the world. At Station 2: Adorna, which calls on all to prepare their hearts, as Simeon did, to be a bridal chamber for Christ, the world's savior. 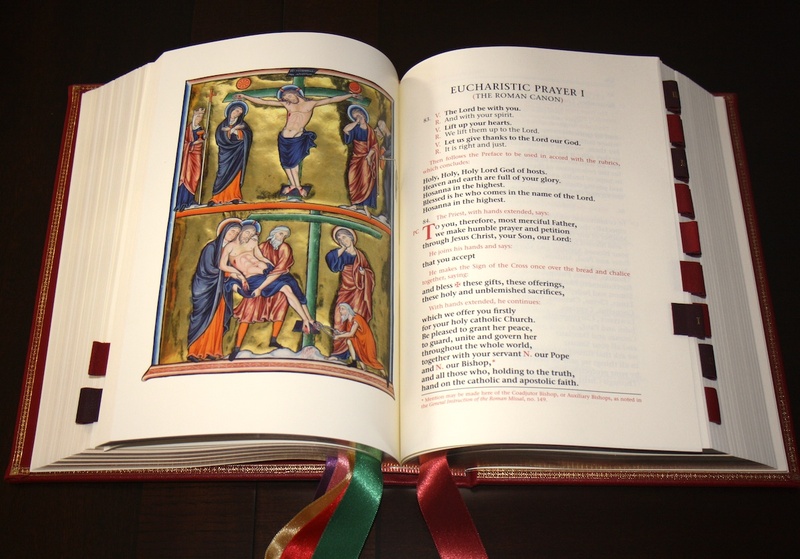 At Station 3: Responsum, which recalls how Simeon had been promised that he would not see death until he took the Light of the Gentiles in his arms. 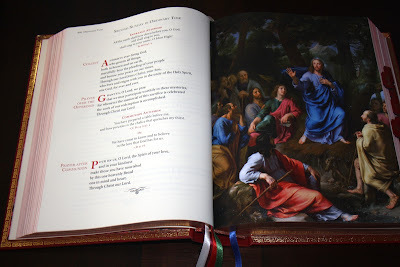 At Station 4: Hodie, which recalls how Joseph and Mary brought the Christ Child into the temple. It is fittingly sung as the friars, carrying their candles, reenter the chapel and take their places in their stalls. 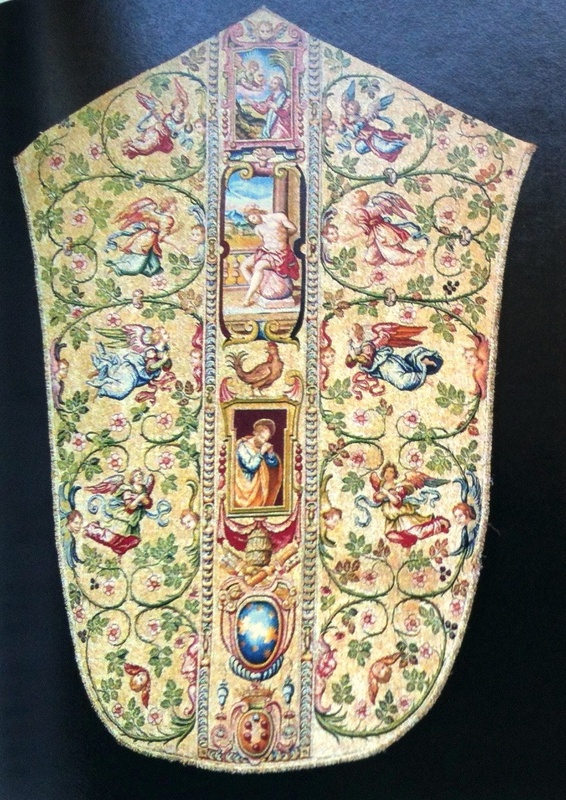 The ministers, meanwhile, return to the sacristy and the prior puts on the chasuble for Mass. When the ministers are ready, the friars begin the Officium of the Mass, Suscepimus. Friars hold their lighted candles in their hands until the Offertory. I might add that in the Dominican Rite the famous sequence Laetabundus is sung at this Mass. 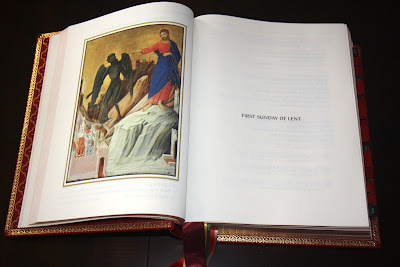 When he has finished the Offertory Prayers, the prior receives his lighted candle and comes with the deacon and subdeacon, holding their candles, to before the altar. The sacristan comes up with a basket to receive the ministers' candles, which he snuffs and places in it. 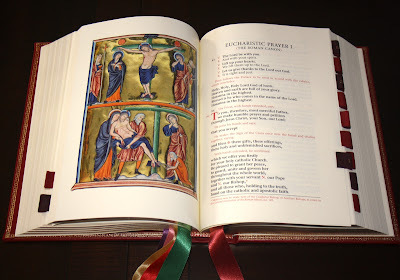 The friars of the community then come forward in procession, in order of seniority, enter the sanctuary, and offer their lighted candles, handing them to the sacristan and kissing the prior's hand. When all have offered their candles, the prior returns to the altar, receives the censer, and does the incensing and the lavabo. The Preface of Mass is that of the Nativity. 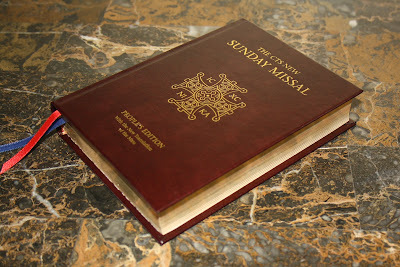 The Proprium Missarum Ordinis Praedicatorum of 1983 provides that these ceremonies may be incorporated into the Mass of the Presentation in the new Roman liturgy. 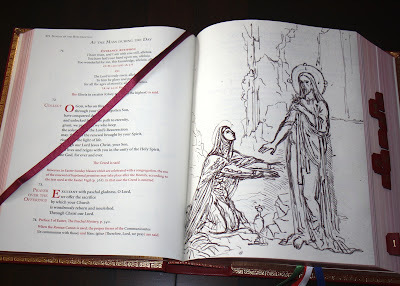 And this includes the Laetabundus, even if the candle rituals are not done. 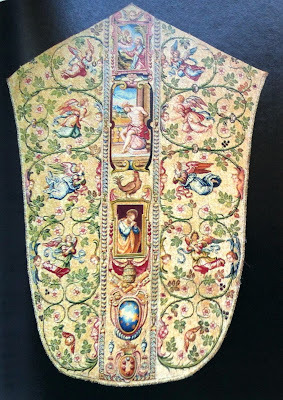 These photographs aren't the greatest, and I have very little information on the vestments themselve, but they show a set of vestments which bear the arms of Pope Clement VIII (1592-1605) and which I believe are in the Vatican collections. If anyone has more information on this particular set, feel free to offer them in the comments. 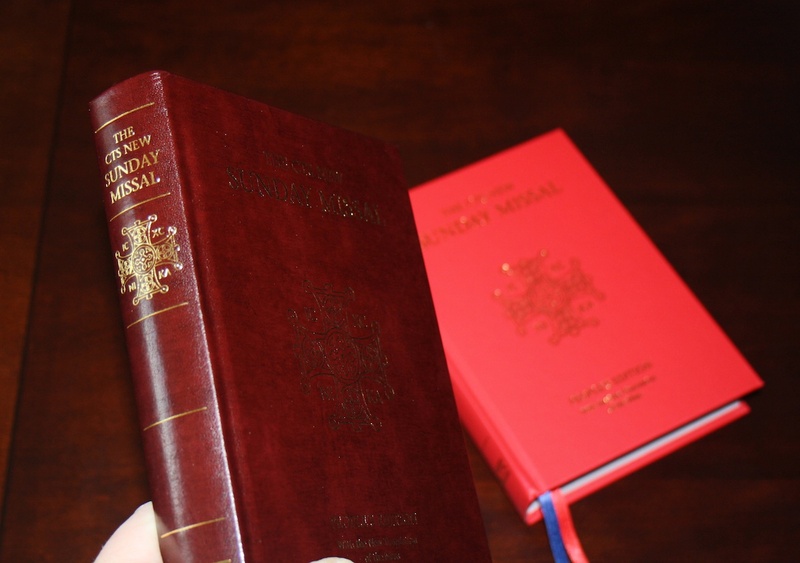 Essentially what we are speaking about here are two editions that have the same internal contents, but one -- the Standard Edition -- is less ornate than the other. As such, let's begin by first looking at this difference, comparing the two, before beginning to look at the internal contents. 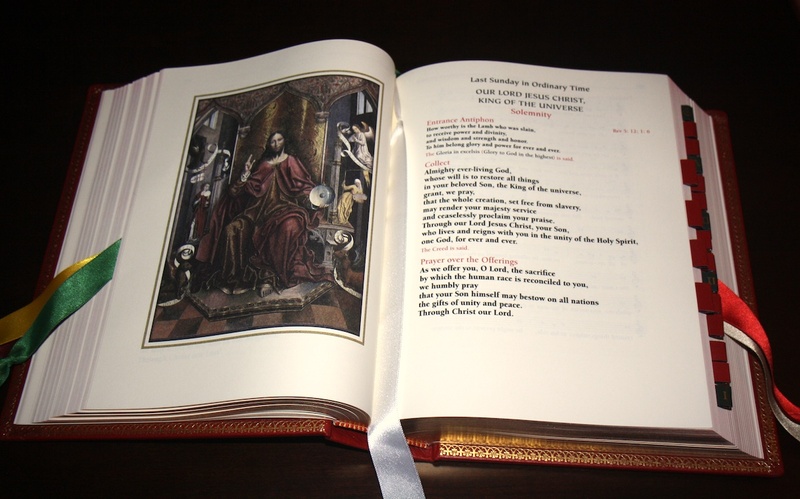 Both covers include gold tooled decoration, including the very beautiful cross design seen also on the front of the CTS Altar Edition of the Missal. 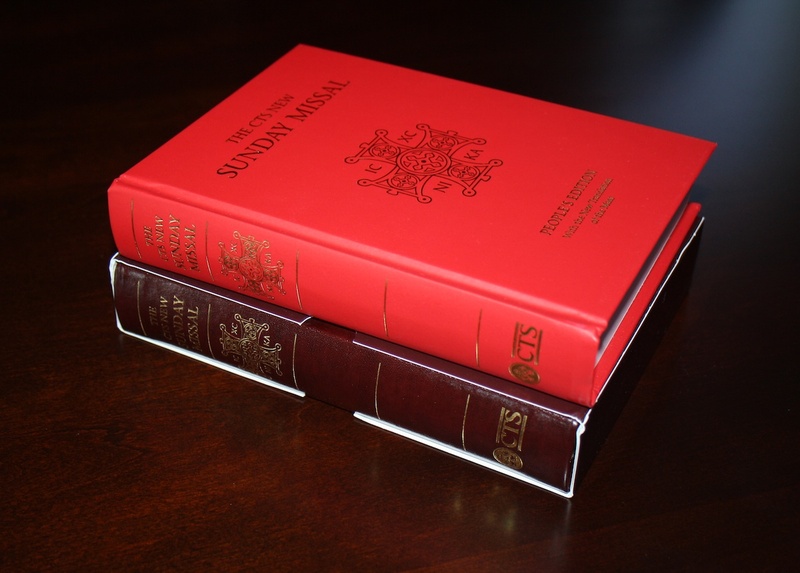 The same design is also reproduced on the spine of both editions as you can see above. This is very attractive in general and equally well done on both editions. I like how they have included some other gilt decoration on the spines which gives each volume a classic feel. 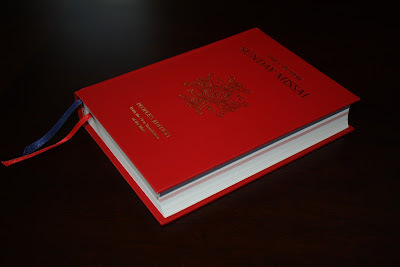 The cover on the Standard Edition is very nicely done, having a very good feel to it; it comes across as very high end. The leather cover of the Presentation Edition is also very well done, but that much more luxurious. Both bindings are sewn and feel very tight. 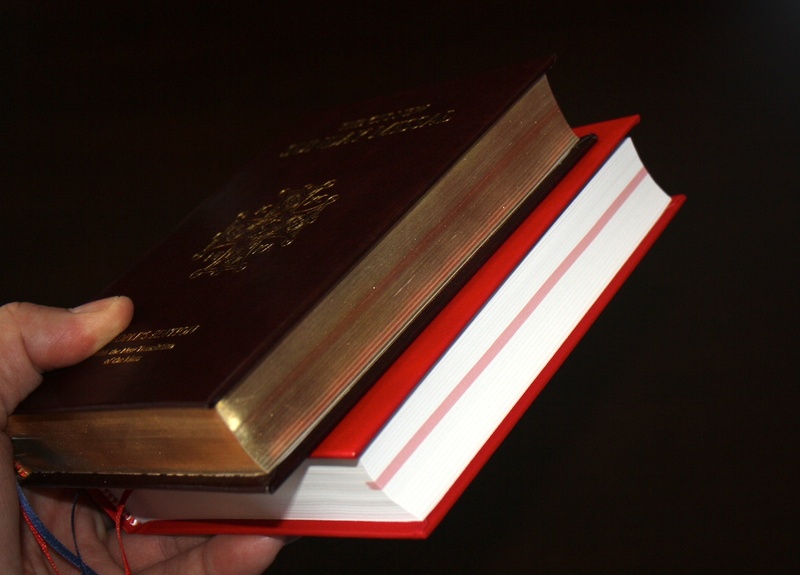 These red edges do not show as well on the Presentation Edition when held like this, but once the volume is opened, they show up very clearly. Speaking personally, both volumes are very well done externally, but for myself, if the extra cost is not an issue, I would personally recommend going with the Presentation Edition to gain on these additional ornamental qualities which are traditional for such people's missals and add to the beauty of the book. Let us now move our considerations to the internal aspects. The first point which I wish to note is that each edition includes two sewn in ribbons. 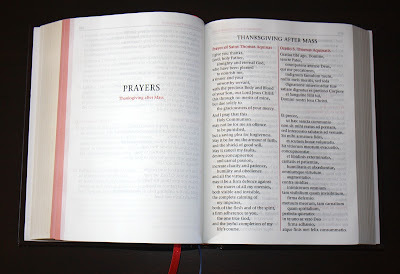 These are good as far as they go and will be useful for marking the Ordinary and the Proper, but my one wish is that at least three ribbons might have been included -- that way the third ribbon could be used to mark some of the prayers of thanksgiving and devotion for example. Even four ribbons might have been desirable. 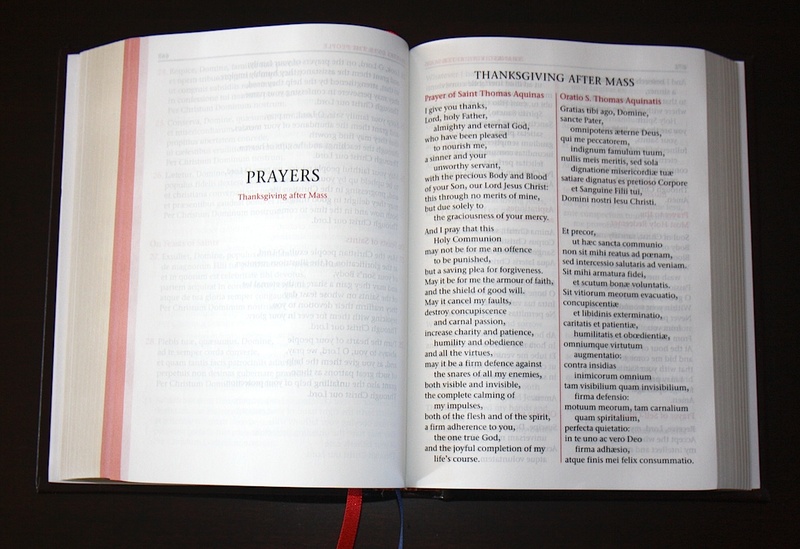 The publishers have also added reflections for the major feasts and seasons. And of course, while it is called a "Sunday Missal", these people's missals also include the Masses for solemnities of the liturgical year. Here are a few views. 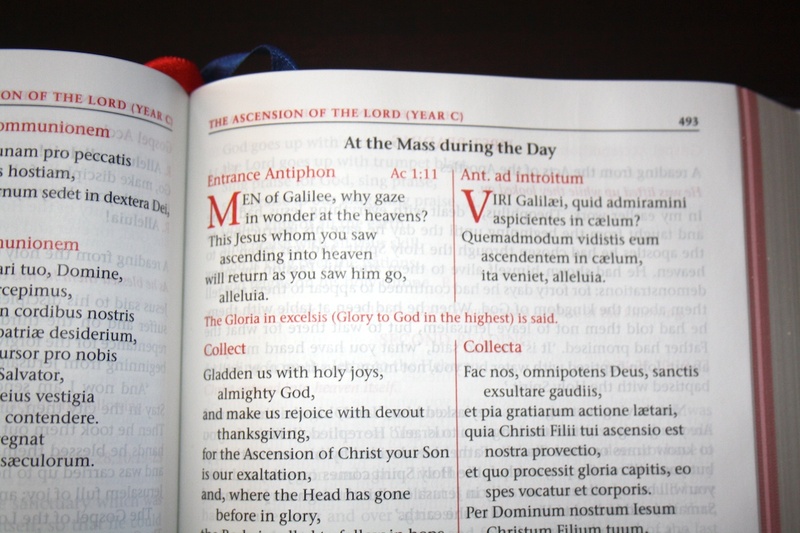 As noted, the ordinary includes fully parallel Latin and English, with the left hand pages being in Latin entirely, and the right hand being in the vernacular entirely. 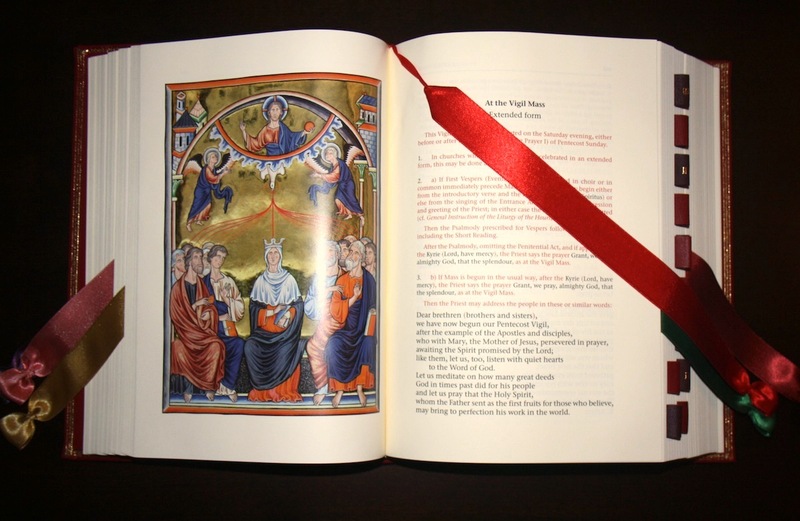 Here is a view of the Roman Canon. All around, I would say these two editions are extremely well done and I was very pleased with both. 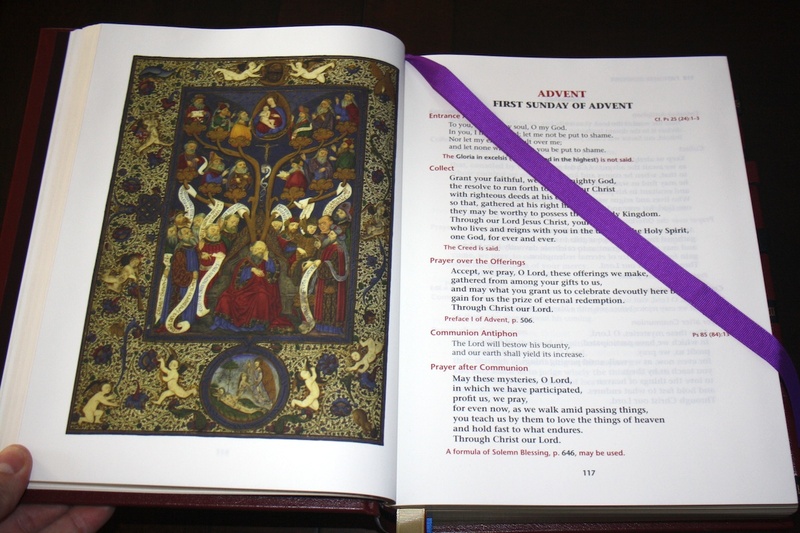 See here for the recording of the homily from the same Mass, and here for the recording of Choral Evensong from St. Anselm's Abbey. For our third and final portion of this review, our attention turns to the interior artwork of these missals. Let's get right to it. Before we get into specific considerations of each missal, let's give a general overview comparison of the four missals placed side by side. 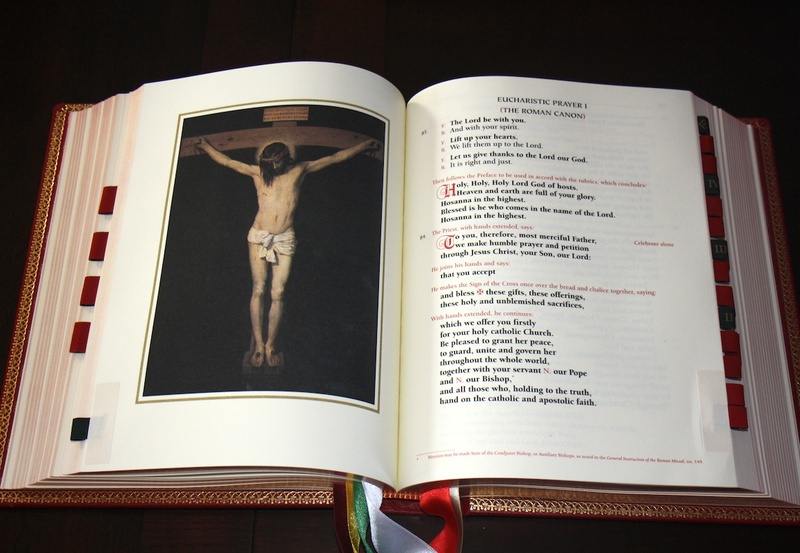 Speaking of each of these missals, one point which I think was lost out upon in each instance was that each Eucharistic Prayer does not include some sort of crucifixion art plate. 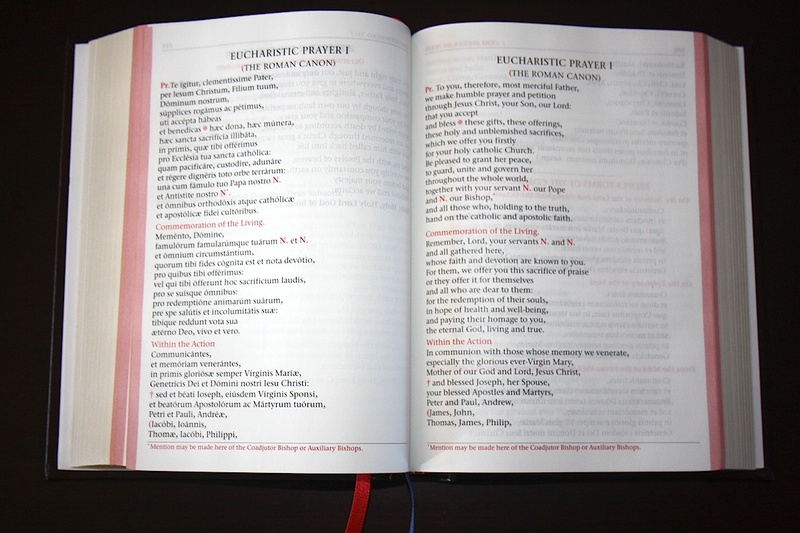 While this would be difficult where a singular source of the Missal art has been chosen (as for example in the CTS edition), I believe it would have been good for each missal to somehow include such plates for each Eucharistic Prayer. The Magnificat edition does include a plate for both EP I and EP II, however in the latter case, this is an image of Christ resurrected rather than crucified. The other editions include a crucifixion art plate only for EP I. 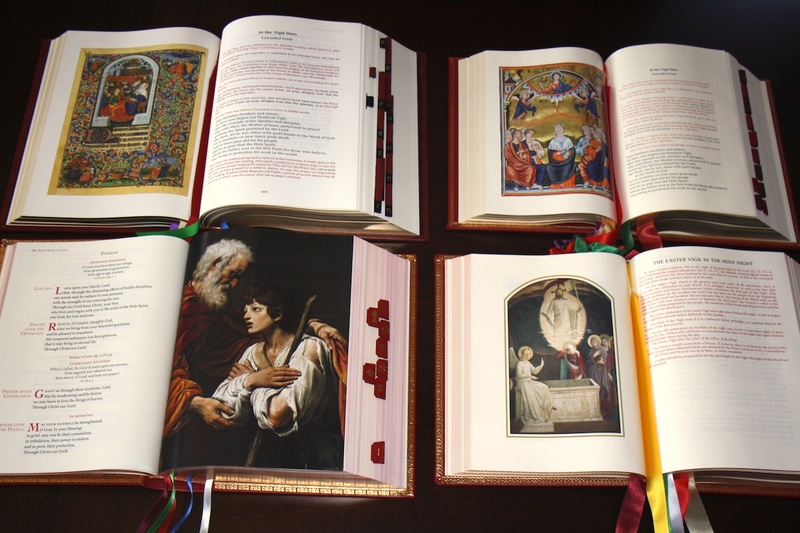 With regard to the art and design of their binding, I haven't rated the WLP edition as highly by comparison with the other three editions under review. However, I have to say that when it comes to the interior artwork, this is another matter entirely. I very much like what they have done here. 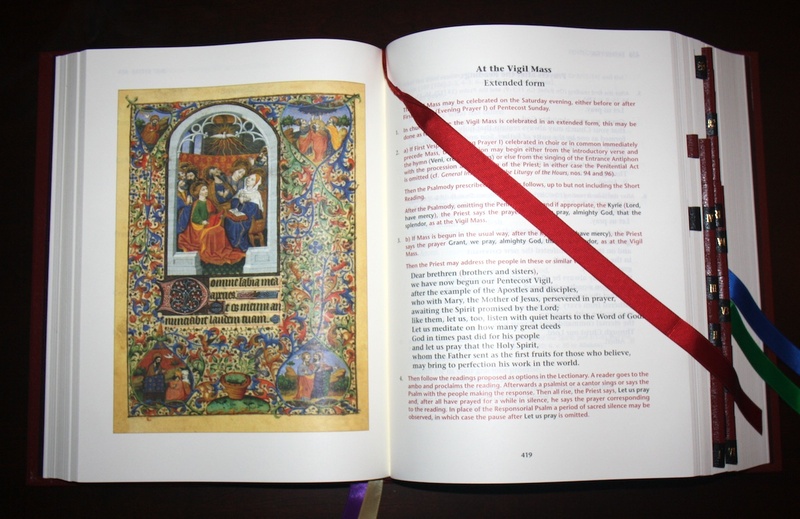 The plates are well integrated into the text, both in the way they are reproduced on the paper, and also in the way they relate to the liturgical texts themselves. 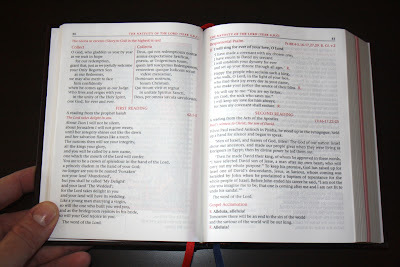 There is plenty of art within the Missal, but one is not inundated with it either. 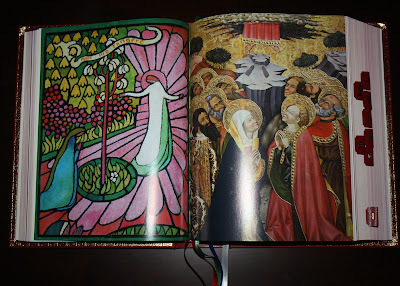 WLP went with art from the illuminated manuscript tradition, and thus the artwork very much presents a consistent and unified sense through the book. 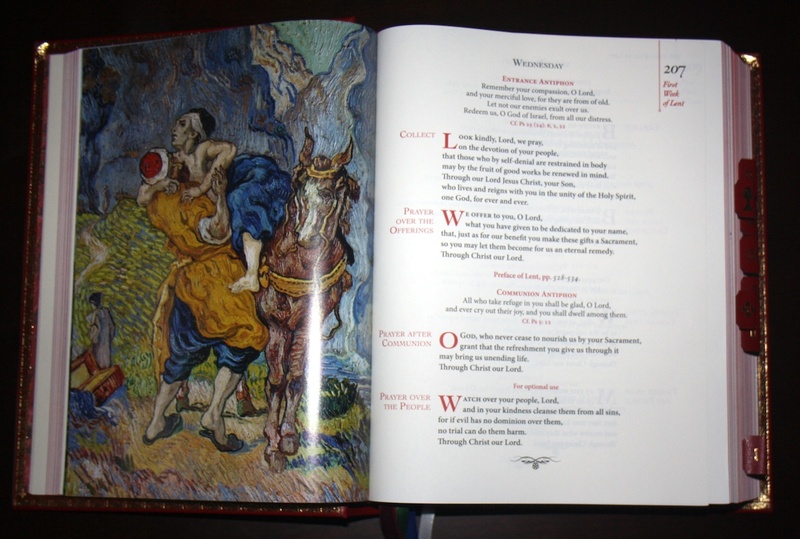 The images are well proportioned to the page and include white space around them, which suitably frames each plate and integrates it well with the rest of the text. 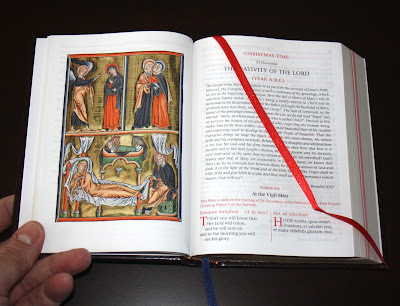 Where I was disappointed was not in the pieces selected, but rather in the way the art was generally approached in this missal, taken as a whole and in view of layout considerations. So then, what do I mean by this? 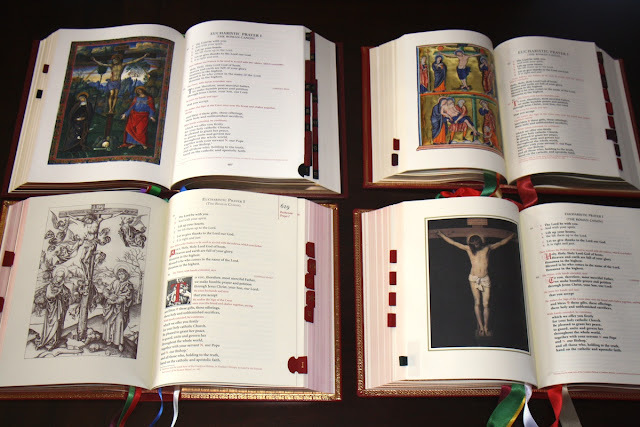 While it is laudable to not take a minimalist approach to the art within a missal, I personally do not believe this is the way to approach an abundant use of art plates. 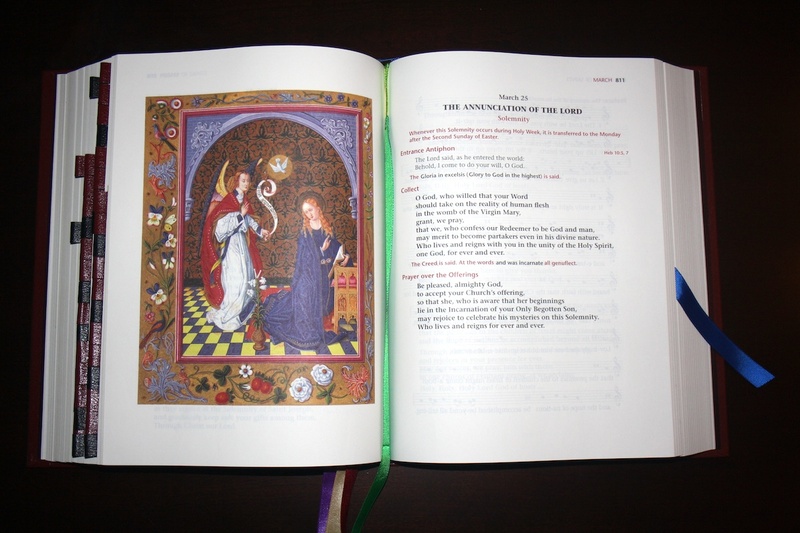 The art of a missal should clearly relate to and embellish the liturgical texts, serving as a sort of visual meditation on the particular feast or part of the Mass being entered into. 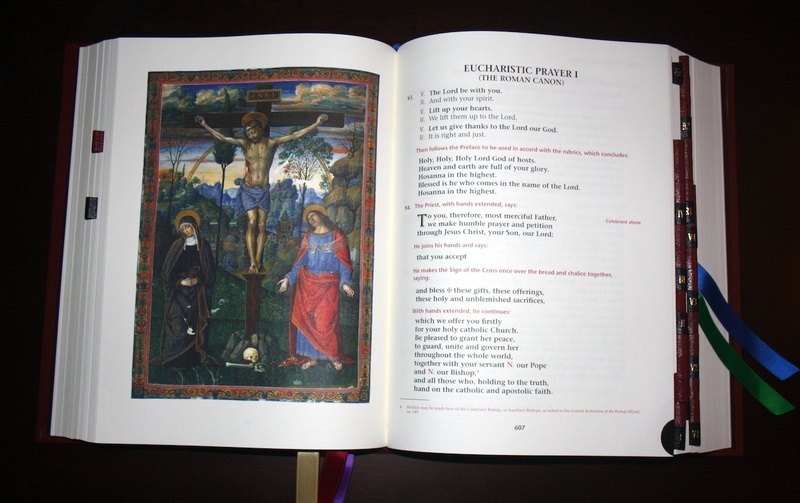 (Hence the crucifixion art at the beginning of the Roman Canon for instance, or an image depicting a saint or one of the mysteries of our Lord to accompany a related feast within the liturgical year). 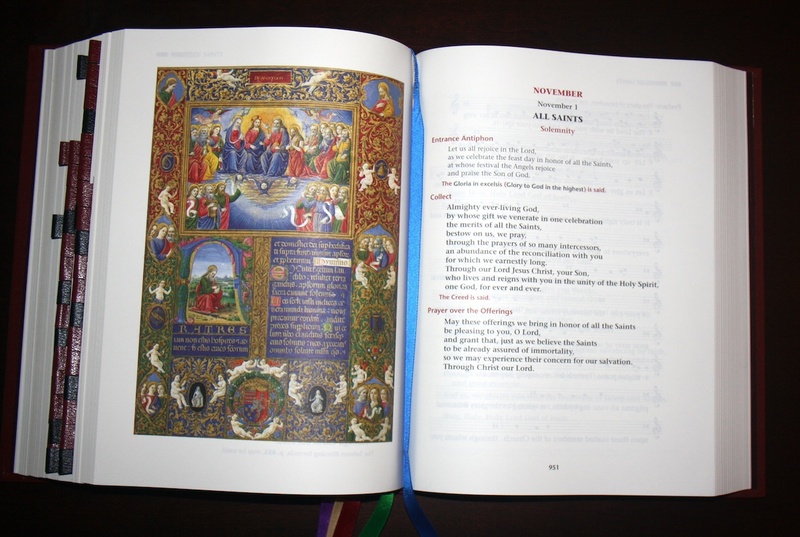 While the art used in the Magnificat Missal does indeed make these linkages to the time of the liturgical year, I can see little purpose or benefit from these double page spreads. 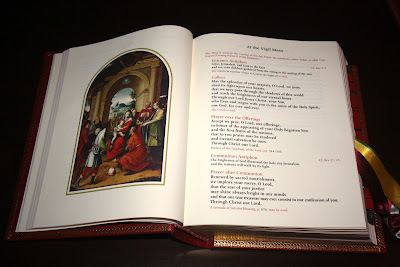 Such spreads may be suitable for an art book or text book (though even in that context they are unsatisfying since the centre of the image is always obscured), but not for an altar missal in my estimation for they offer little or no real co-relation to the liturgical text, being pages that would never be turned to in the liturgical use of the missal. 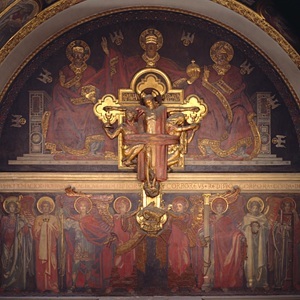 Further to this matter of the layout of the art, I would also comment that, with the exception of the crucifixion plate opposite EP I, the art work lacks any sort of bordering, with the images being published right to the edges of the page. 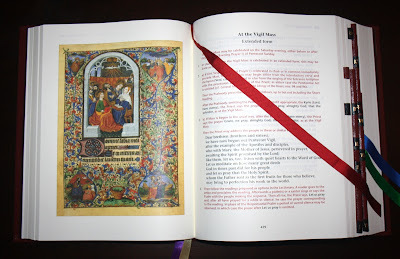 Here I would reference back to the tradition of manuscript illumination and book printing in general where plates and illustrations nearly always included white space and potentially other bordering as well. 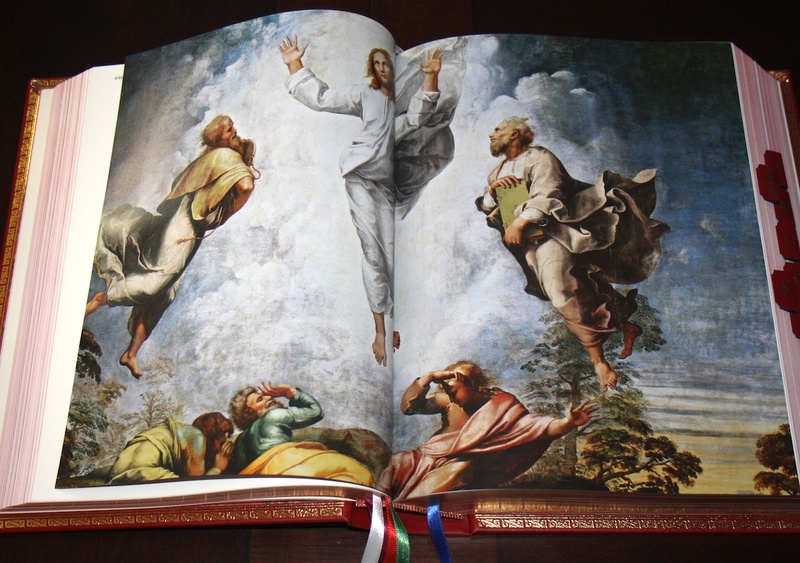 Within a book context, having art without any sort white space is, to me, comparable to hanging a picture on the wall without a matte and frame; the result tends to look unfinished and informal. 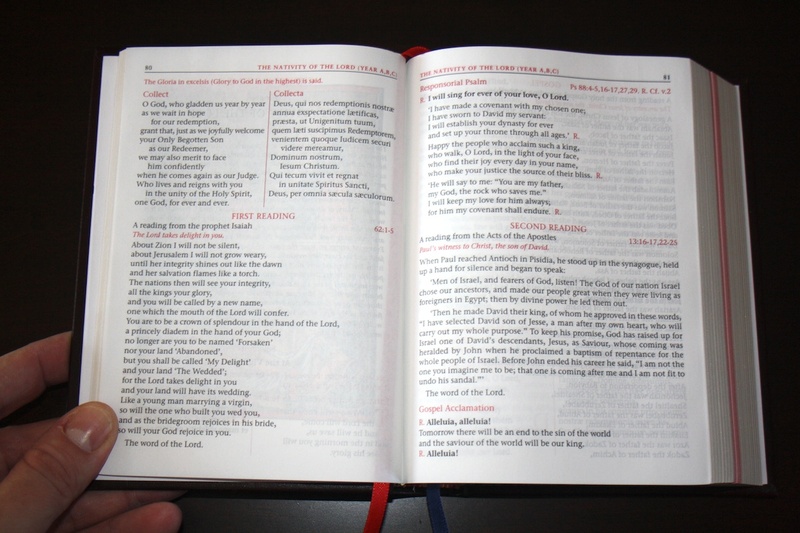 The other issue I would raise with the artwork selected for the Magnificat missal is the fact that it widely varies in style and type. 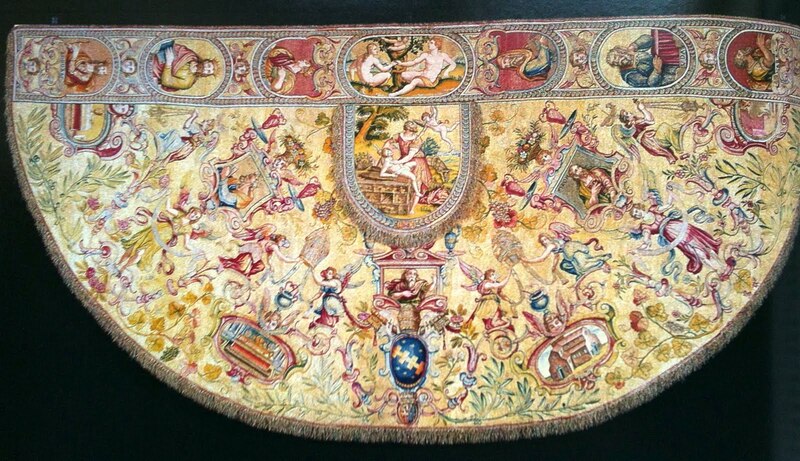 Various periods are covered from the ancient right up to the very modern; art is used that ranges from full colour plates to uncoloured woodcuts and engravings of different styles and levels of detail. 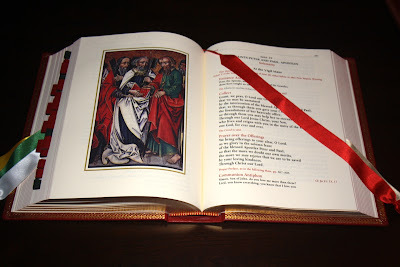 The result is a lack of stylistic unity which therefore doesn't integrate as well into the missal as a whole I think. I will say that, taken on its own, the EP I page is wonderful. One will note the white space and bordering and how much of a difference this makes in giving a more finished and sophisticated look. I would point out as well the drop capital and how well this all integrates together here. I want to reiterate that much of the art found within the Magnificat Missal is quite beautiful in and of itself. 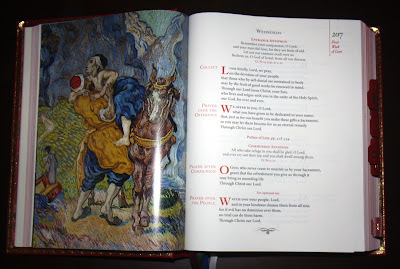 There are some beautiful engravings and some glorious works in stunning, vibrant colour. My primary issue with regard to the art selected is that I believe it would have been better had the publishers had either chosen one style or period of art, or at possibly two (perhaps one for the colour plates and one for the non-coloured plates) and then given the art a more "bookish" and finished appearance by way of the bordering already discussed. 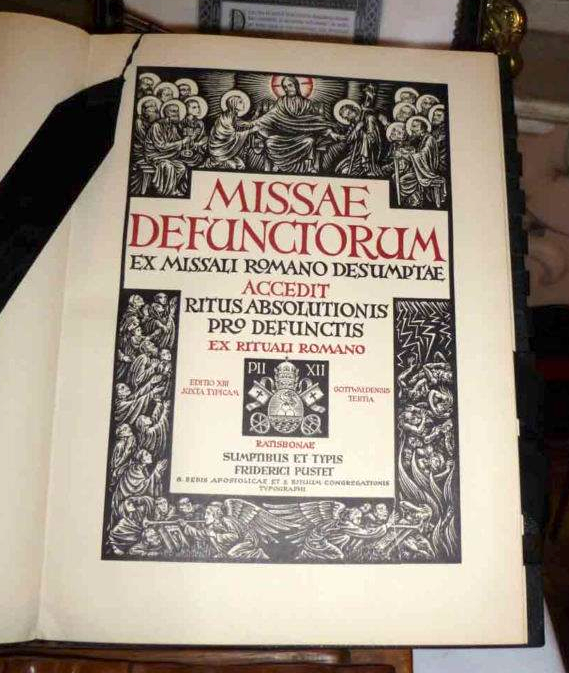 While I appreciate that there was likely an intent to include art of differing styles and differing periods in Magnificat's case, to accomodate a variety of tastes, and while I can appreciate the desire to not take a minimalist approach, to me this is an example of where less would have been more. 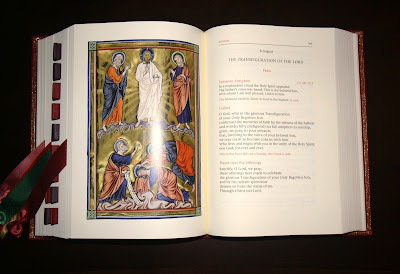 Like WLP, CTS chose to use art from the manuscript tradition. CTS made the decision to obviously use a singular source for their art and I think the result is very good indeed. 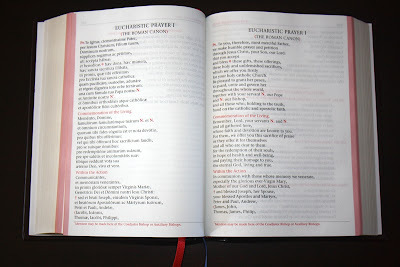 Their approach, in this regard, most puts me to mind of the missal printing tradition of old. Very well done indeed overall and certainly very visually appealing. 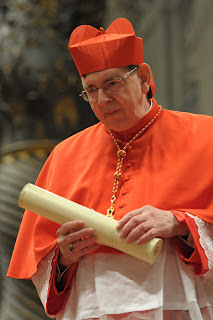 It is certainly one of my favourites of all the missals I have seen, including those others not covered by this review. Finally we come to the MTF edition. While MTF's edition does not use art from a singular source as the CTS edition does, it does however present art of a very similar stylistic quality, and this helps to avoid any sense of disunity in the art. MTF opted, like WLP, to not go with a glossy paper format for their artwork, and as I note this is really a trade off. What they lose in vibrancy of colour, they gain in the very consistent integration of the art with the rest of the printed text. As with the CTS and WLP editions, MTF uses white space to frame their images, and beyond that, they have also added a gold border around each image in edition. I think this works very well and to good effect. 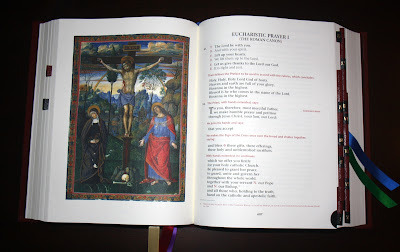 While I like all of the other "Roman Canon" pages of the four missals shown, I must confess it is very pleasing to see the Velázquez Crucifixion used in the MTF edition, which certain gives a nod back to the Benziger Brothers missals used within the context of the usus antiquior. They have done a very fine job with their art. I will have to say that I appreciate the artwork of the CTS, MTF and WLP editions equally. Each have merits to be seen in their own particular approaches, and each, more importantly, bring dignity and beauty to the respective missal, integrating well with the liturgical texts. 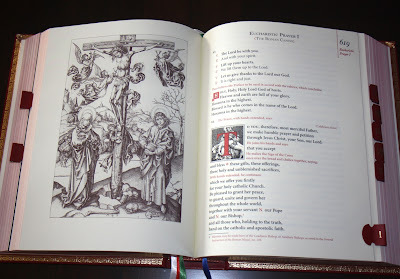 As noted early on, a missed opportunity for the art work in all of the editions is the lack of crucifixion plates for each of the Eucharistic Prayers. I would hope this might be considered in future editions. My one final comment here about the matter of missal art is that I would generally like to see a revival in our liturgical arts pursued such that we not only rely on the artwork of previous generations, or rely on adapting art from another context to these particular purposes. While we know this can work, as is evidenced above, it seems to me that we should also look to commission original artists to specifically design and execute art for our liturgical books again. While that is admittedly not a small project, neither is it an impossible one. I believe this would be very enriching, if well pursued and well thought out, and would offer a range of potentialities, from the classicist painter to someone operating more within an illuminative tradition. Yes really, I do mean at the Boston Public Library. It is quite a surprise to go into the public library and find a wonderful set of murals painted by the great American artist. One room has a huge set of murals on an Arthurian theme and then right at the top of the building is a room that the library calls quite simply 'Sargent Hall'. 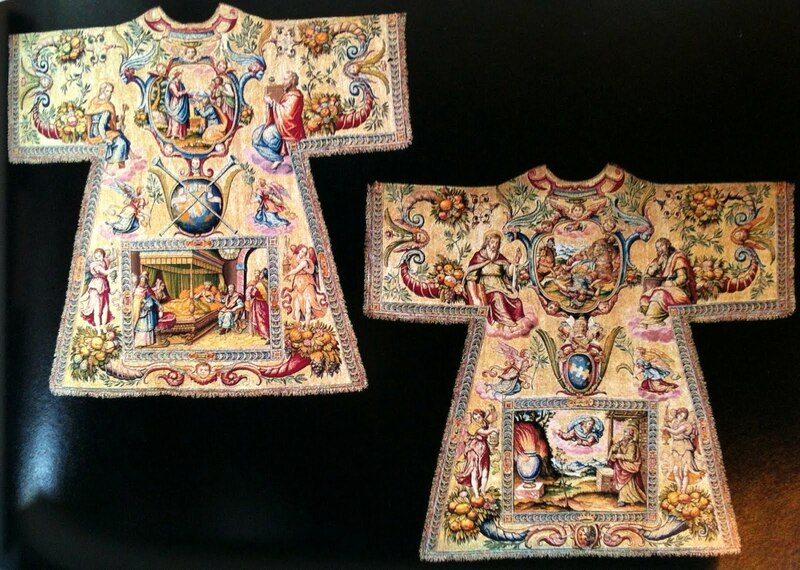 This are adorned with a set of Christian sacred imagery all conforming to a unifying schema. I had heard about them before but only this past weekend have I seen them for the first time. They are oil on canvas set into the wall, with some painted plaster cast reliefs and were painted in a 20 year period from 1895. What surprised me was how Catholic the imagery is for civic buildings. Boston's Irish Catholic heritage is well known, but I hadn't anticipated that this Catholic influence would have reached up to the level of the dignitaries of the city at this time. Perhaps there is a high Episcopalian influence here as well? We have murals of the Old Testament prophets, of the crucifixion with the a representation of the dogma of the Trinity and angels carrying the instruments of the passion, Our Lady of Sorrows and the 15 mysteries of the rosary. Apparently when artistic tastes turned against the naturalistic style around the early middle 20th century, they were almost destroyed. Luckily for us were saved and the suggestion to paint over them was opposed. If these had been painted in England at the same time by any other artist, they would most likely have been in the pre-Raphaelite, and indeed there is some of that feel about them. 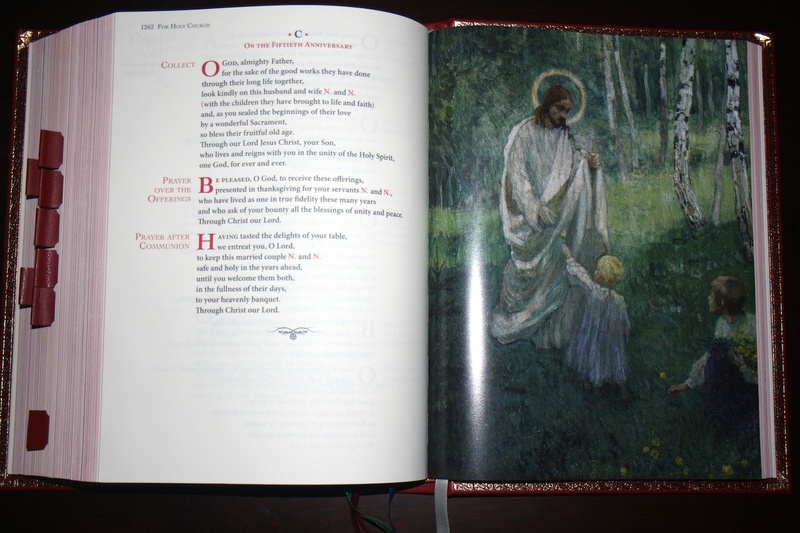 However, Sargent, who is vastly superior to the English pre-Raphaelites, in my opinion, brings his knowledge of the 17th century baroque (which is the authentic liturgical root of the Western naturalistic tradition) into play. So just we would have seen in this earlier original period, we see in Sargent's work here the controlled intensification and depletion of colour; and variation in focus, carried out selectively to ensure that our eyes are drawn first to the most important points in each composition. The pre-Raphaelites in contrast painted with sharp outlines and even colour and so they overburdened their paintings with detail. It is very difficult to manage complicated compositions with many figures Sargent handles the variation of these components so brilliantly and subltely that I find it difficult characterise further what he is doing beyond knowing that he is doing it. The room, which is just a 3rd floor hall in the library leading to others containing library books, is difficult to photograph and so I give you the best I have been able to get hold of. 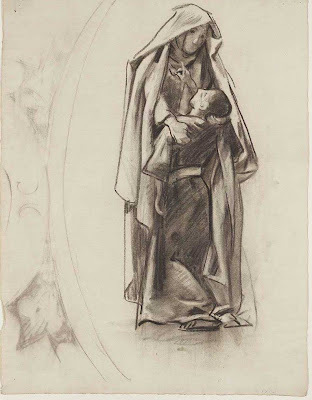 One thing to point out about the style is that even though Sargent was trained as portrait painter, he seems to have understood the difference between sacred art and portraiture. The faces are less emotional and quite often placed in shadow, allowing us to identify with the general human characteristics of the person portrayed. 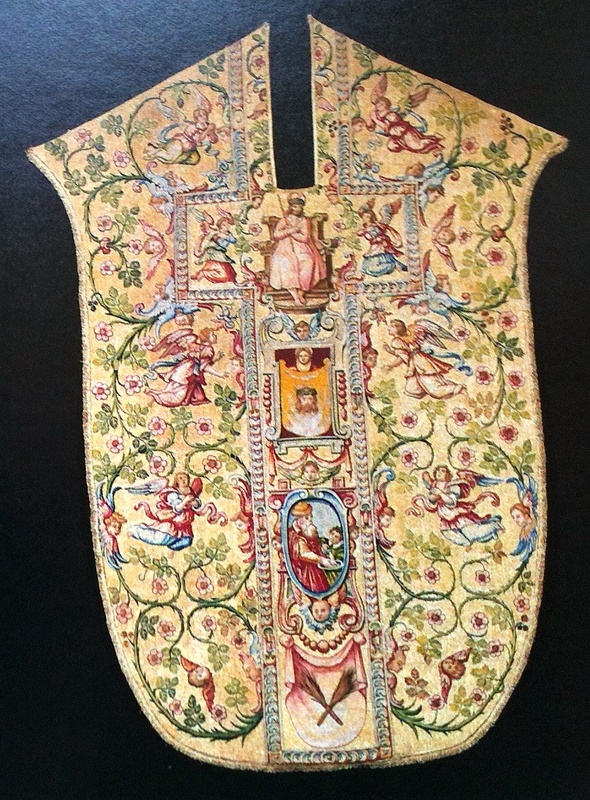 This is in contrast to other sacred art of the 19th century and in accord with what a master of the 17th century, such as Zurburan, would have done. I have talked about this in more detail in an article called Is Some Sacred Art Too Naturalistic? 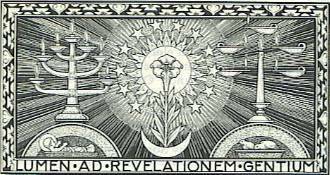 We can see this brought out especially in the sketches for one of the mysteries of the rosary. 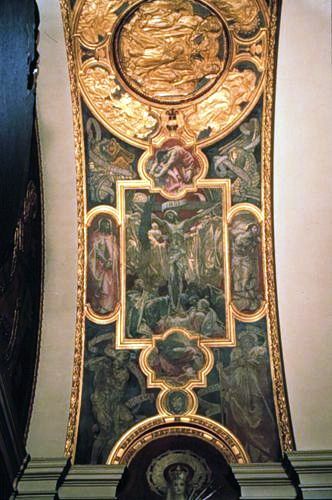 The ones shown are for the finding of the boy Jesus in the temple. 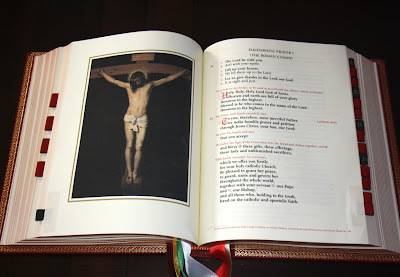 As I studied these I was trying to picture these as a focus of prayer if they had been placed in a church. My personal taste in this regard is for the iconographic or gothic, so I am not the best person to make a judgement here, but my sense is that for those who are strongly attracted to the baroque style as liturgical art, these would seem appropriate and helpful. 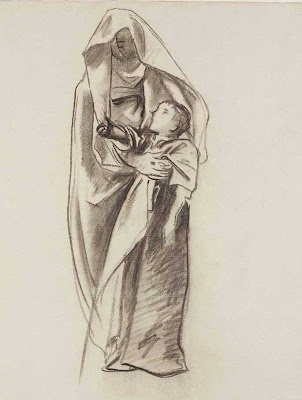 Certainly, I think that those Catholic artists who are interested in painting sacred art and have been trained in the academic method should study Sargent's style, which owes so much to the earlier 17th century form. 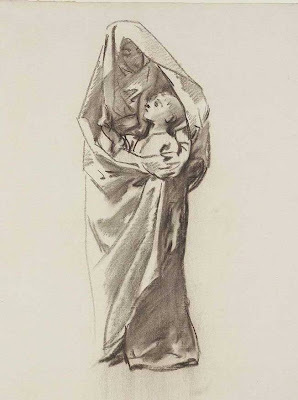 This will help them to avoid the trap of imitating inferior artists of the late 19th century such as the aforementioned pre-Raphaelites and William Bougeureau (the reason that his style should be avoided, in my opinion, is described in the article linked above). The Sorrowful Mysteries, above, and the Glorious Mysteries, heavily gilded, below is a photo of the full set of 15. 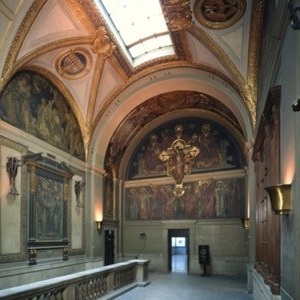 This is painted on the arched ceiling of the room.